We like to think that we’re a pretty adventurous pair when the opportunity arises. The minute we booked our trip to Grenada, we started investigating what types of fun activities were available to us, off-resort. Not 5 minutes into our searching, we remembered the Island Routes Caribbean Adventures company that works alongside with Sandals Resorts to offer resort guests of Sandals exclusive tours to take during their vacations! Scanning the website exclusively for the Grenada location, we learned that tours were offered based on request, the time of year, and the number of resort guests who may (or may not have) also signed up for the tour that day. We decided to wait until arriving to Sandals Grenada before making any concrete plans. When the day did come for us to do further investigation while at the resort, we learned of which tours were being offered, and on which days. Learning that some specific tours only ran if there were a minimum of 8 guests signed up, we decided to try our luck at the tour titled “Captain Your Own Speedboat” and crossed our fingers in hopes that we would get to experience this one the next day! As luck would have it, the resort staff called us that evening to let us know that the tour would be happening, and to meet at the Island Routes kiosk by 8:30am the next morning! Up and at it the next day, having eaten, and fully lathered up with sunscreen (we burn easily lol) we were ready to go! We boarded the tour bus with 3 other couples our age and were driven into town, down to one of the main ports where we met with our tour guides. Placing any items that we didn’t want to get wet (change of clothes, cash, etc.) securely behind the front desk of the marina office (with the office admin watching it for us), we were told the rules and given our life jackets. Following our instructor to the rubberized speed boats, we were given instruction on how to drive them, and to not crash into anything or else we were going to be paying for it up front (fair enough, I guess). Leaving our shoes in the designated bin, each couple hopped on to their own boat and off we went, slowly driving out of the marina and past the anchored yachts and fishing boats until we got out into the open Caribbean sea! Speeding across the choppy ocean (holy hell was it ever windy that day, especially on the water!!) we sped around the southwest area of the island, breezing past beautiful beaches to our first stop: and underwater sculpture park. Once we all pulled up and attached each boat to the guide’s anchored boat, we swapped out our life jackets to snorkel vests, given our flippers, masks and snorkels, and followed our snorkel guide around the underwater park. (Unfortunately I didn’t capture any photos here – I left my phone on my boat, terrified that water would leak into the case and damage it/lose all of the photos and videos I had taken during the trip up until now. Sorry friends!). After snorkeling for 30-ish minutes, we made our way back to our boats, climbed back on board and headed for another joy ride at top speed to catch some more incredible views of the shoreline consisting of white sandy beaches (including the famous Grand Anse), past celebrity homes (such as Oprah and Morgan Freeman) and on to catch a view of Sandals at the southernmost part of the island! Swinging back around we were brought to what is known as the most beautiful beach in all of Grenada: BBC (or Morne Rouge). Pulling ashore, we hopped off our boats into the crystal clear water and explored the beach. Covered in tropical tamarind trees and palm trees, this place was absolutely stunning. There were hardly any tourists in the area, which was great – it felt like our tiny group had the place to ourselves. While we were exploring the beachy area, one of our guides pulled tamarind fruit from the tree for us to sample (deliciously sour – I can still taste it when I think of it! 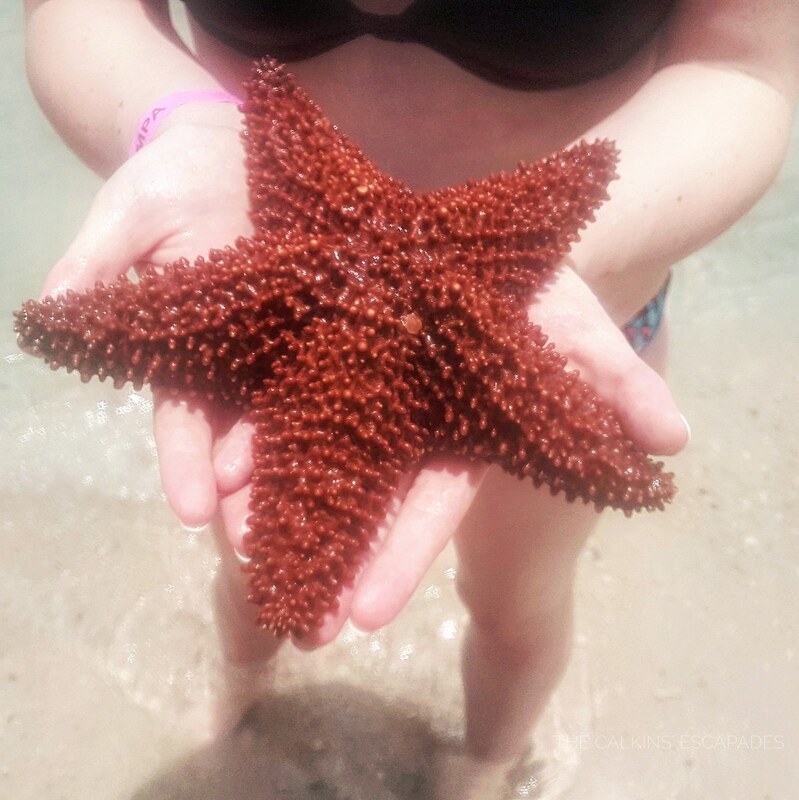 ), while our other guide swam out and brought some sea creatures (like star fish and conch shells with the conchs still living inside) closer to shore for us to see. I was even lucky enough to hold a tiny octopus! 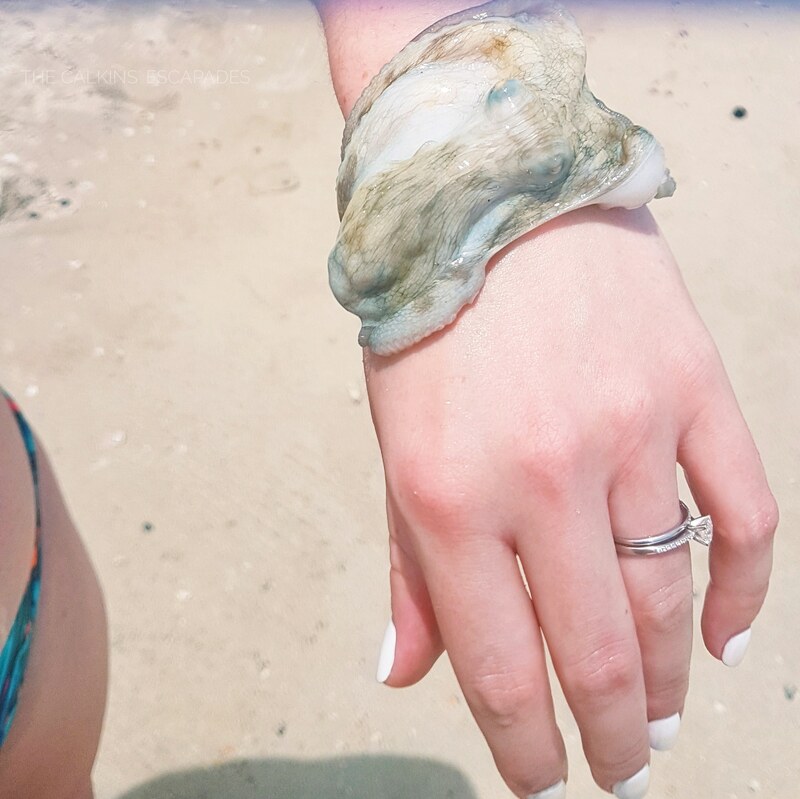 (It was as slimy as you think it would be haha). After hanging out for a bit, we hopped back on our boats to head back to the Port to go back to our resort. We had a blast on this tour! We got to experience a lot of firsts, and genuinely enjoyed exploring the island from the water. A very unique experience, with some great people, and wonderful tour guides, we would definitely recommend checking out Island Routes if ever you’re considering taking a tour through Sandals! Have you ever taken a tour while visiting a Caribbean island? What did you do? Leave us a comment below! Previous [VIDEO] Island Routes Tour Grenada: Captain Your Own Power Boat!